Ever since 1926 only the finest quality peanuts have ever been used to make Black Cat peanut butter. This is healthy and nutritious spread has a great taste and crunchy peanut pieces that give your sandwich that extra bite of peanut power. Peanuts (Minimum 91%), Cane Sugar, Stabiliser, Salt. Brought this back from mauritius for a cat lover because of the name. The best peanut butter yet. 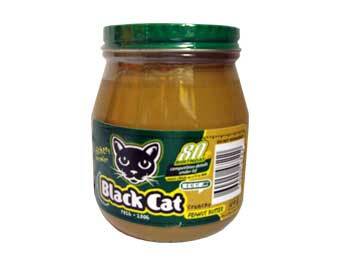 Like mayo must be Hellman's : peanut butter must now be Black Cat.